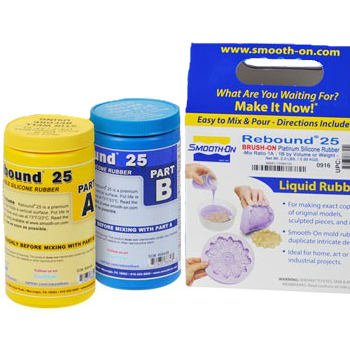 Rebound 25 is a platinum cure silicone rubber. 1 to 1 mix ratio. Able to be applied vertically as it will not sag. Cures with negligible shrinkage to a flexible rubber. Sold in a 2lb trial size. Please visit Smooth-On for additional technical information and project ideas!